There are all kinds of ways to hedge volatility these days. No investor need fear a bear market – let alone suffer the ravages of getting financially mauled. 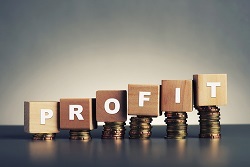 There are all kinds of ways to run flat or down markets to your advantage if you are properly prepared, have the right perspective and a firm grasp on Total Wealth tactics. So far we've talked about specific Total Wealth tactics like lowball orders, which you can use to buy the stock you want at exactly the price you're prepared to pay – ideally at a huge discount. We've also covered position sizing as a means of limiting risk before you place a trade, trailing stops to protect your capital once you're "in," and free trades to help you maximize profits when it's time to sell. Today, I want to introduce a new wrinkle. I want to show you how to buy more stock without spending more money. It's a simple, easy-to-use investing strategy that's ideally suited for today's markets and, best of all, one that could lead to profits of 2,426% or more. As always, I've got a few examples and stocks that can help you put what you learn today into action immediately. Here's the Total Wealth tactic that turns flat or down markets to your advantage. Millions of investors lurch from investment to investment in a desperate search for the one stock that will turbocharge their returns. And, in doing so, they ruin their portfolios. Stock selection, as it turns out, is only part of the mix. If you want to earn the big bucks, you've got make sure your money is working as consistently and efficiently as possible. What I mean by that is that you want to be making money with everything you own every day. If you're moving from stock to stock, you may as well be playing roulette. The principle of Gambler's Ruin that I talked about last week will ultimately bleed your wealth dry. When I say consistently and efficiently, I am talking about putting something in place that will keep your money moving through thick and thin, that will keep you tapped into upside, and will ensure that you're constantly buying low and selling high. We talk about that a lot because that's the first step on the path to profits. You find something that's beaten down yet still has a fortress-like balance sheet, strong sales, and growing revenue, and you buy it because it's tapped into an Unstoppable Trend. The second is to keep your money moving by reinvesting it. That way you can capture the powerful upside bias inherent in today's financial markets, even in flat or down markets. I know that sounds like a tall order, but actually it's a lot easier to do than most investors think. 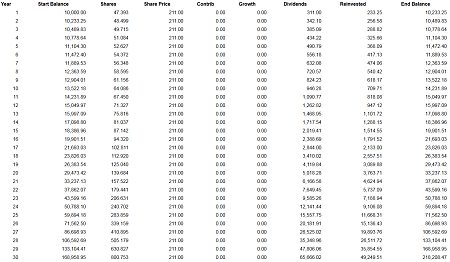 Imagine buying 100 shares of ABC at $100/share for a $10,000 initial investment. 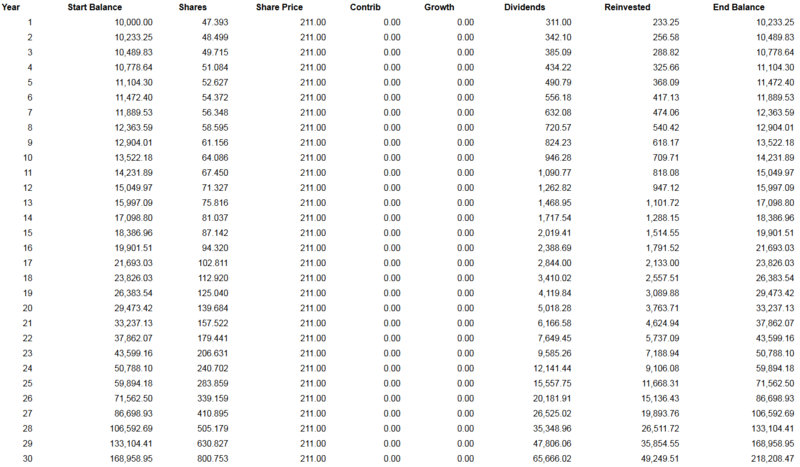 And that ABC has a dividend yield of 2.31%, which is the average yield offered by companies on the S&P 500 at the moment. A year down the road you would have earned slightly more than $231 back in dividends (it's slightly more than 2.31% because of the miniscule short-term effect of compounding quarterly rather than all at once, yearly). I know that doesn't sound very inspiring yet, but hang with me for a minute. But on year 2, you've got approximately $10,231 invested, and at a 2.31% yield, that translates to $10,467. Year 3, $10,709. Year 4 brings $10,956 in capital working for you. By year 5, dividend reinvestment would have allowed you to purchase $11,209 in company stock, a figure roughly equivalent to 11.2% appreciation. The company never raises its dividend. 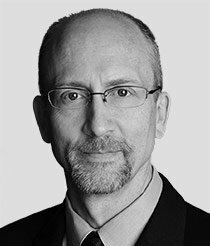 Now, you and I both know that's not going to happen – the best companies (like those we follow at Total Wealth) raise their dividends constantly, and the markets fluctuate, which means that your money is going to get more valuable over time… again, even if prices go down before they go up. 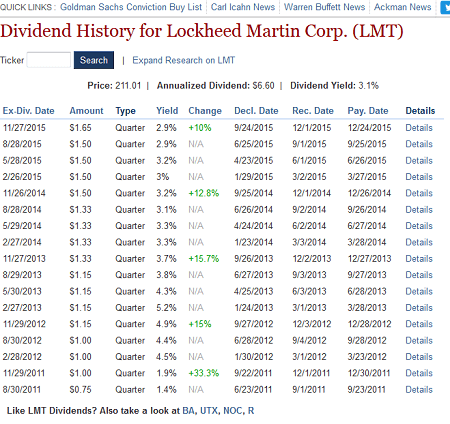 And that brings me to Lockheed Martin Corp. (NYSE: LMT). The company is tapped into one of the biggest Unstoppable Trends of all: War, Terrorism, and Ugliness. What's more, its current 3.11% yield is higher than our example, and management has a history of dramatically increasing payouts. So let's rerun the numbers. Assuming the dividend increases by 10% annually and the stock remains flat, you'll have $14,231 in 10 years. That's a 42.31% return. It's not glamorous, but keep in mind that you would have earned $946 in dividends by year 10, which works out to an impressive 9.46% yield… just because you kept your money moving consistently and efficiently. In 30 years, you'd be sitting on $218,208 and a 118.2% return. Most impressively, though, you'd be earning an eye-popping $65,666 in dividends just for that year ($49,249 after a 25% capital gains tax), which amounts to a 392% yield on your initial $10,000 investment! Whenever I'm doing a presentation on this topic, it's usually right about now that the hands start going up… but what about a declining market? 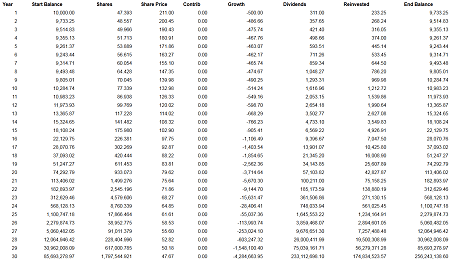 Surely a stock that goes down by 5% each year for 30 years is a losing proposition regardless of the dividend, right? Believe it or not, when the price declines by 5% each year but the dividend payouts rise, you actually end up with more money than you'd have if the stock hadn't lost any value! If there's a bell ringing in the back of your head, this is why I constantly talk about managing upside. Selling out may feel good, but doing so takes you out of the game. Being able to purchase more income-generating shares year after year at cheaper prices clearly outweighs the downside of 5% losses on principle each year. Missing out on upside is always the far more expensive proposition over time. Keep in mind that we're talking about 2,462% returns in a 30-year bear market. …high quality companies tapped into our Unstoppable Trends making must-have products and services that translate into rising revenue, rising earnings, and – ta da – rising dividends. The financial crisis of 2007-2009 didn't stop high-quality companies like Altria Group Inc. (NYSE: MO) from raising its dividend payout by 17% during that time frame. It didn't stop Raytheon Co. (NYSE: RTN) from boosting its payouts 21%. 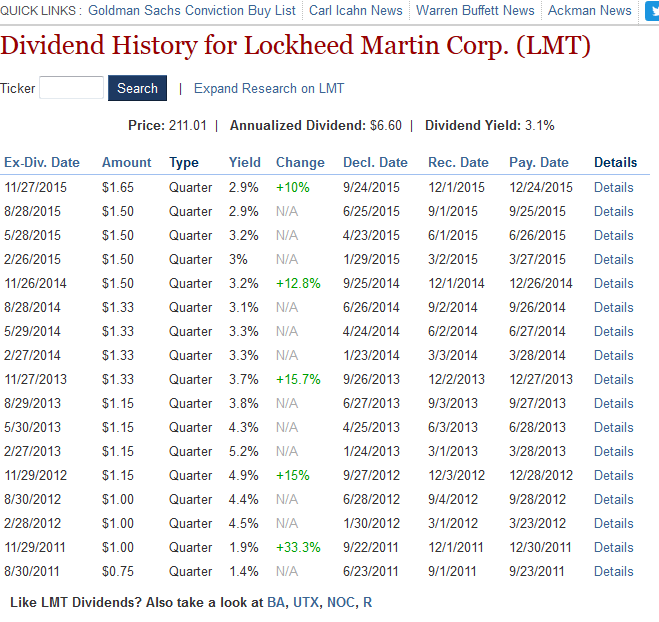 And it didn't stop Lockheed Martin, which we used in our 30-year example, from hiking its payouts a stellar 80%. The next crisis won't either. All three companies are great choices under the circumstances. Editor's Note: The dividend reinvestment strategy can squeeze profits north of 2,000% out of a bear market as Keith has shown you – but you don't have to wait 30 years for returns like that. In fact, Keith has identified a sector that's going to double several times before 2020, potentially bringing a small-cap robotics company he's uncovered along for the ride. To read his free report on the human augmentation company that could be poised for 2,184% gains in just a few years, sign up for Total Wealth here it's free!